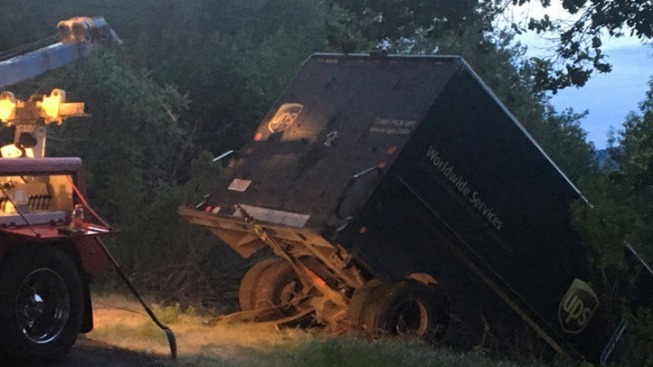 Police and fire crews in Lafayette spent hours searching for the driver of a UPS truck that struck a tree and crashed down an embankment along a remote road Wednesday evening, according to a Contra Costa County Fire Protection District fire captain. The search finally ended late Wednesday night, when 44-year-old Dennis Salazar, of Fairfield, was located at a friend's home in Concord. He was taken into custody, police said. At 5:09 p.m., fire officials received a report of a crash involving a UPS truck near 1701 Hunsaker Canyon Road, fire Capt. Lisa Martinez said. According to the report, the truck struck a tree and the driver was believed to have been ejected. Emergency crews first on the scene found the truck about 40 feet down an embankment. The man behind the wheel, later identified as Salazar, was nowhere to be found even though he's the one who called 911 to report the crash, police said. They believe the driver's phone died soon after the call. Lafayette police called in drones with infrared radar, helicopter assistance from Moraga and Orinda and 60 members of the county search and rescue team to scour the steep rugged terrain. Police dogs also were assisting with the search, Martinez said. There were no signs of injury and no blood at the scene, police said. Deputy Rick Kovar of the county search and rescue team said during the search that Salazar most likely walked away, though he couldn't be certain whether he was hurt. Additionally, crews searched local hospitals and left photographs of Salazar.